I am so excited that the SeaCrate site is now live! I’m thrilled that, to help me celebrate the new business and promote her fantastic new Ocean Soul jewelry line, the amazing jeweler Julie Anderson has provided these gorgeous sterling silver bezeled sea glass pendants for each of the first SeaCrate boxes. The monthly subscription boxes are under $40 each and these pendants alone are worth more than that, making the boxes an incredible value. I’m so grateful to Julie for partnering with me for the limited edition kick-off box! Check out the Crate Joy website to sign up for the limited edition box until the end of May. After that the July boxes will begin to be sold. The subscription pricing works like this: if you sign up for one box it’s $38.99/mo but the price goes down as low as under $30 a month if you sign up to a year’s worth of boxes. Shipping is included. 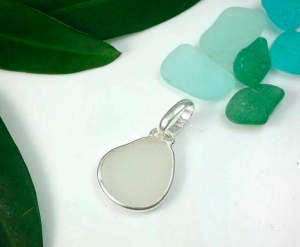 Each box contains loose sea glass, shells, a bath or body product, a sweet/salty nautical-themed treat and other ocean goodies, plus one lucky “treasure box” holds a sea marble and one other lucky treasure box in June holds a fantastic pair of Julie Anderson’s earrings. Each box will also hold an ocean-themed notecard, this month from Sea Glass Publishing because I think we should all be sending each other more handwritten notes- who doesn’t like getting them?! I know I love it. Anyway, away we go! Sea you soon. 🙂 Sign up today at SeaCrate!